It is Sunday morning, the fifth of October. We rose around five and set off with our guides to make sure we could be in the forest half an hour later. It’s dark and there’s a chill in the air as we walk to our transport for the short trip into the mountains. We have been stalking morning and evening every day, and we have also found time in between for some stand hunting. But one thing is certain: these guides are no strangers to stalking red deer and they know where we are most likely to find the animals we’re looking for. 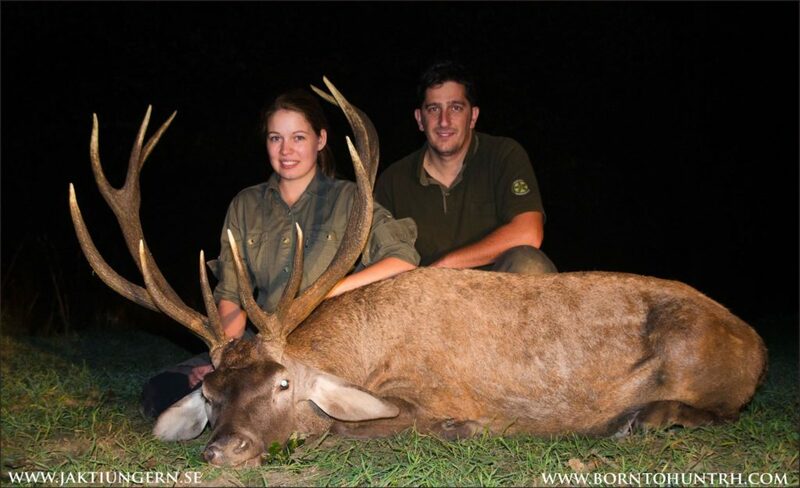 My father had the good fortune to shoot a stag on our first day in Hungary. Its antlers were typical for the deer in this area, eight points, evenly spread. For my part, I’ve only caught a distant glimpse of a couple of hinds and calves during these first few days. My father and his tracker have crossed paths with several stags of varying stature, but none has come my way. Today I’m hoping for a share of their good fortune, as we’re intending to head to another section of the 16,000-hectare game preserve, 66 kilometres north of Budapest, set amid rolling countryside, deciduous forests and mountains. En route to our first stand of the day, we catch a glimpse of a red stag in the thin strip of forest that leads us straight into the dense undergrowth. The Hungarians are experts at making what they call ‘pirsch’ paths, stalking paths through even the thickest undergrowth and vegetation. We are 50 metres from the stag, which is approaching us like a shadow, when he suddenly stops in his tracks. Then we hear how he hurls himself into the bushes flanking the path, his horns crashing into the branches and breaking them off as he forces his way though. “Stag!” says the guide, and when we pass the spot where the animal bolted into the brush, we can sense the strong, musky smell of a rutting buck lingering in the air. 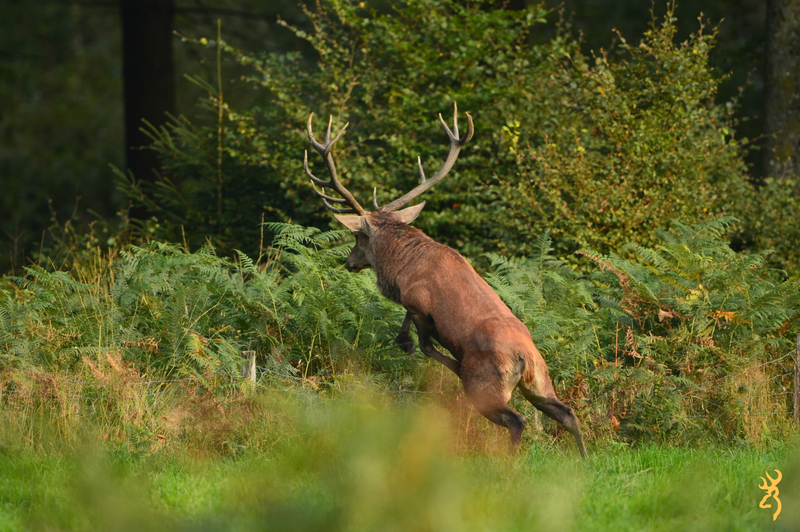 It is the second rut of the year for stags, which typically lasts between a couple of days and up to a week. The different stands that have been our starting points each morning have been very carefully thought out. Many of them don’t seem to be particularly promising when seen from ground level, but once you climb the tower, a new world opens up before you. The day’s first tower is located beside one of the few clearings we have seen during our hunts. It is still quite dark and the sun has not yet risen. A thick mist hangs over the clearing, making it difficult to see whether any animals are out and about. We can hear a red deer hind calling her fawn, and there are sounds of more animals on the move out there somewhere in the mist. We wait anxiously for the first rays of the sun to give us the chance to spot something in our binoculars. As soon as the sun starts to peep above the horizon, the mist begins to clear. Some 200 metres from the tower we can see a solitary red deer grazing under a cluster of oaks. The guide says that it looks like a young stag, but it is still too dark to be certain. We can just make out the horns in the shadow of the leafy trees. It is not yet light enough to see clearly through the binoculars or to take a photo. But as the sun continues its slow climb into the sky, the guide raises his binoculars to take another look – and suddenly whispers, “Wow! It’s a good stag!” But he is far too young, and his antlers promise too much for the future for us to cull him now. The guide estimates the stag’s age at around six years; at a guess the trophy weight must be more than six kilos. He explains that the animal needs to be allowed to grow for another couple of years before it can be hunted. Just a few scant moments before the light becomes strong enough for a photo, the stag saunters off into the bushes and is gone. Some hinds and their calves pass through the clearing and make their way along the gravel track that meanders through the countryside. We also see some young stags, maybe two or three years old, following an older hind. She is probably in the late stages of oestrus, but she finds their attentions exasperating. She kicks and thrashes out at them before they dart away, leaving them in no doubt about her total lack of interest. Things gradually grow quiet around the tower, so we descend and spend a few hours stalking, creeping stealthily through the undergrowth. Although there are no more deer to be seen, our spirits remain high; we can, at least, console ourselves that we have had some sightings of stags. As we retrace our steps towards the transport waiting to take us back to base for breakfast, we startle a few hinds with their calves. They stand there for a while, scrutinising our every movement. They can probably sense that we are hunters and before long they move on. It’s clear that the red deer are starting to move deeper and deeper into the thickets, so we decide to terminate our morning reconnaissance and save our energies for the afternoon. There’s no hunting after breakfast. It’s Sunday, a day off for many people, and the forest is soon filled with walkers, cyclists, mushroom pickers and so on. The deer have taken refuge in the thickest brushwood and undergrowth they can find. We agree to rendezvous with our trackers again at around four o’clock. Hopefully, things will be a little quieter in the forest by then. On our way back to the hunting grounds we pass cars and tourists galore. The journey takes only 15 minutes or so, but by the time we arrive at our destination, all is calm and quiet. It is a beautiful afternoon, gilded with bright sunshine. The previous evening someone had sighted a shootable stag from the stand where we will soon be on look-out, which is located adjacent to a newly planted field of rye. We see lots of doves and jays around the field on the fringes of forest – a dense thicket of oak saplings in front of massed ranks of large oaks. It bodes well for the evening, but there are still a couple of hours to go before sunset. We wait, excitement coursing through our veins. The acorns constantly tumbling through the leaves make a strange clattering sound, not something we are used to or have experienced when hunting back home. The silence is also broken by oak boughs brushing against one another in the breeze and the occasional crack as a branch is broken off – a sound remarkably like that of a deer moving furtively through the forest. By the time dusk begins to fall, we have been sitting for almost two and a half hours without any sightings. The sounds around us, however, seem more and more to suggest the presence of deer at the edge of the forest. Time and time again I glance at my guide, but he merely smiles and shakes his head. The longer we wait, the more fervently we will our quarry to appear. The wind has eased, so now even the slightest sound from the forest can be heard with clarity. The jays screech tetchily at one another; something has irritated them. Then, with the last rays of sunlight lingering on the tree tops, the forest falls silent. No birdsong, just trees creaking and the rustle of leaves. When all of a sudden! Suddenly I feel a gentle prod in my side. The guide is pointing towards the bushes a couple of hundred metres away on our right. From behind a thicket of young oaks a hind appears with her head held high. She sniffs the air, taking in her surroundings for a minute or two before she makes up her mind to venture into the open. We notice that there is a calf tripping along behind her, probably the young mother’s first offspring. Their path across the field will bring them ever closer to us. But then, after they have emerged into the open, we spot another silhouette stepping out of the shadows. A stag! The high antlers, tines tipped with white, glisten in the dark as he follows the hind. The guide promptly signals that this is a suitable stag for me. Carefully, I put on my ear defenders and reach for my Browning. The stag begins to trail the female. It would appear that she is on heat, but she is reluctant to mate and veers to the left with her head lowered. The stag suddenly loses interest and instead stands stock still, presenting me with a perfect broadside at a distance of no more than 200 metres. I have raised my Browning X-Bolt Composite 30.06 calibre and, when the stag decides to relinquish his chase, the crosshairs are resting squarely on his shoulder. I squeeze the trigger and see his lightning-quick reaction as he registers the shot. It’s clear that he’s been hit hard. He charges 50 metres along the edge of the field. My first shot has found its mark exactly where I aimed, but the stag is still standing. I have already reloaded, so I don’t risk waiting but fire a second time to bring him down. This time I have aimed a little higher up on the shoulder and he falls on the spot. Given that the dense undergrowth is all but impenetrable for us hunters, it is a great relief when, from our vantage point up in the tower, we see him collapse. Only then does the realisation begin to dawn on me that I have shot my first red deer. What an adrenaline rush that gives me as I study him through my binoculars. The thrill of the moment sends a flutter of nerves through my body. Before I pulled the trigger, I hadn’t really taken a good look at the stag. I was relying totally on my guide and didn’t want to risk the shakes before I took the shot. Every shot, every hunting situation is unique, and no more so than when you are about to bring down a new species. As we descend slowly from the tower and make our way to our trophy, the hind reappears from her refuge in the forest. She walks gingerly towards the stag, unable to fully comprehend what has just happened, but then we draw closer and she bounds away in among the trees. I crouch down beside the stag, raise its head and examine the antlers. I’m ecstatic and my heart is beating wildly. It’s a genuine “pinch myself in the arm to make sure I’m not dreaming” scenario. I ask my tracker to estimate the age of the stag and the weight of the antlers. He replies that it’s probably getting on for seven years old and that the antlers should weigh something over six kilos. The knowledge that these people possess never ceases to impress. A week after my return to Sweden, I receive a phone call telling me that my stag was worthy of a Hungarian bronze medal – an added bonus that proved to be the icing on the cake as far as my trip was concerned.